Dennis Moser releases his beautiful guitar-based ambient music under a variety of project names, including usr/sbin. What does the name mean? Well, if you have to ask, then suffice it to say you must not be a Unix geek. 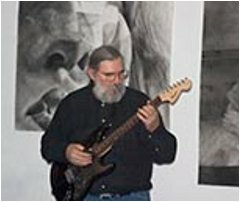 Based in a variety of locations throughout America, Dennis has been long regarded as a talented ambient guitarist, as well as the owner of one of the largest collection of Lexicon Vortexes in the known universe, but he is perhaps best known for his work in Second Life where he performs live improvisational music as AldoManutio Abruzzo. Over the past two years, Dennis has performed numerous concerts at a variety of venues and has built up quite a fan base. In addition to his work in Second Life, Dennis does installation work under the moniker audiozoloft, and occasionally releases stunning ambient albums under the usr/sbin name through his own web site as well as through a variety of netlabels. Earth Mantra is proud to be bringing you the music of this talented artist, and we look forward to much more from Dennis in the future.